With a heavily revised format in consideration of the recent DCH clinical examination changes, this new edition of the comprehensive revision guide provides the candidate with a definitive, one-stop revision resource. Written by an experienced author team with extensive knowledge of the exam through its role teaching DCH courses, this title is currently the only revision guide that is focused on the clinical part of the DCH examination. 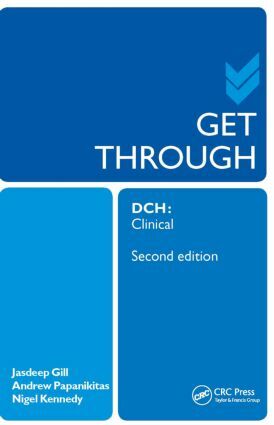 Get Through DCH Clinical is essential reading and revision material for postgraduate candidates preparing for the clinical part of the DCH examination. Andrew Papanikitas BSc (Hons) MA MBBS DCH MRGP GP, PhD Student, Sessional Tutor in Medical Ethics, Law and Professionalism, Facilitator on Interprofessional Education and Ethics Course (KCL), Organiser for undergraduate and postgraduate medical education at the Royal Society of Medicine and THe RCGP NWL Faculty. Jasdeep Gill MBChB (Hons) DRCOG DFSRH DCH ST2 GP Specialty Trainee, London Deanery. Nigel Kennedy BSc (Hons) MA MBBS DCH MRCGP Formerly Chair of the DCH Examination Board and Senior DCH Examiner. Retired Hospital Practicioner in Paediatrics and GP.